A WalMart in North Dallas, Texas, just off the George W. Bush freeway and Marsh rd, consistently had 5 cent .22 ammunition when I visited my Daughter in October. When I checked in late November, there wasn't any more on the shelves. I was disappointed, and believed that the .22 bubble was re-inflating. I was gone for a couple of days, but checked out the display again on 29 November. In October, a WalMart employee, who wished to remain anonymous, told me that the same people came in when .22 bulk packs were available and bought them all up. They did not buy the 50 round boxes, because they were not worth their time, with a 3 boxes per day limit. The bulk packs were bought up regularly. Maybe the ammo resellers were on Thanksgiving vacation on the 29th of November. Maybe they noticed a slump in demand. I cannot be sure why, but there on the shelves were five boxes of Winchester copper-plated .22 LR, 333 round boxes for $14.97. 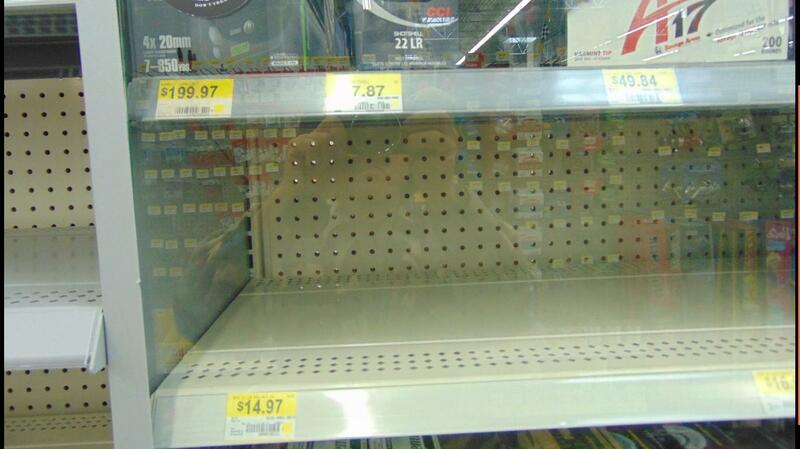 This was late in the afternoon, about 4:30 p.m. WalMart restocks .22 ammuntion in the morning, I have been told. That price converts to a little less than 4.5 cents per cartridge. I predicted the bubble would be considered burst when .22 ammo became commonly available at 4 cents a round. The demand is still up, and supply has not increased enough to get to that point, yet. But I am commonly hearing of people being able to obtain .22 cartridges in limited quantities for 5-7 cents a cartridge, and 8 cent ammunition is fairly common. The production plus shipping and retail profit price of inexpensive .22 ammunition is likely below 3 cents a cartridge. Most of the current profits are going to middlemen like the enterprising Wal-Mart shoppers, pawn shops, or local gun shops. I have seen quite a bit of .22 ammunition at 10 cents a cartridge or higher. Much depends on the political climate. The more President Obama talks of the necessity of restrictions on gun ownership, the more the bubble will re-inflate. The more the media cartel publicises public shootings and/or terrorist attacks, the more demand will remain high. But, the desire to have a supply of .22 ammunition on hand at home is being satisfied. When the demand drops below the level of supply, prices will come down and stay there. It is hard to predict when, in the current political climate. ©2015 by Dean Weingarten: Permission to share is granted when this notice and link are included. 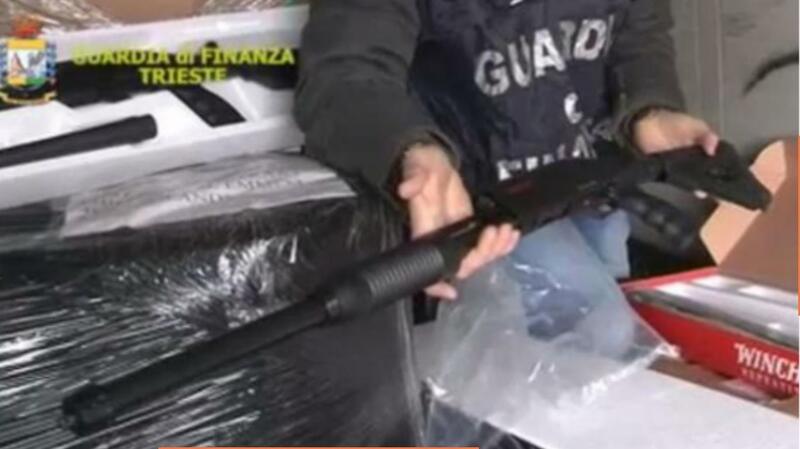 Were Shotguns Seized in Italy for Terrorists or Citizens? Although customs rules were not broken, police said the driver did not have licences required to transport the weapons and the Turkish manufacturer was reportedly accused of breaching national security regulations. And gun dealers report that it is women driving the sales rush. This year alone, police say 70,000 guns have been sold. 'Virtually all shotguns are currently sold out, because you need no permit for them', said Thomas Ortner, spokesman for an arms dealer in Upper Austria. As terrorist attacks increase, demand for weapons rises as well. And so do the current government attempts to keep weapons from their citizens. Will European governments back off of their strict gun control policies? I doubt that the present governments will. But if more attacks succeed - and it seems likely that they will - those governments may be replaced. France is a likely candidate to be the first. France is already credited with having millions of illegal guns in the country. 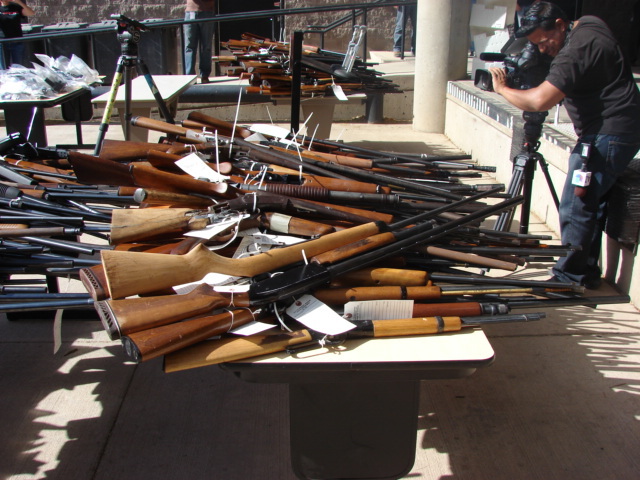 The number is estimated at 7.5 million legal guns and 10-20 million illegal guns, many of them firearms from WWII. If France backs off of its current strict gun control scheme, it will likely attempt some form of "amnesty" to have the illegal firearms brought into government control. Having had numerous firearms declared illegal in the past, and confiscated, it is likely that few old guns will be registered. In response to a sharply rising crime rate in Jamaica in the early 1970s, the government imposed complete gun prohibition. In fact, possession of a bullet meant a mandatory life sentence in prison. There was a special gun court where people would be tried in secret for gun possession offenses. And in conjunction with this tremendous crackdown on guns, they also did everything else that you can imagine Oliver North or Ross Perot doing to our Bill of Rights in your worst nightmares. They had gun sweeps, drug sweeps, militarized law enforcement, the government breaking into people's houses, with no probable cause at all, to look for illegal weapons and drugs. Every kind of oppressive measure you could want, censorship of violent television and movies, everything you could want in terms of "let's get really serious and crack down and get rid of all these silly constitutional liberties that are standing in the way of rough and tough law enforcement," they did. What happened was the crime rate and the homicide rate dropped substantially for the first six months. They then started to rise again, got back to their old levels, and within a few years were far ahead of their old levels, and a few years later were at double and triple the levels which had inspired this kind of crackdown in the first place. That description was written in 1995. Since then, the murder rates have risen even more, to peak about 2009. Jamaica murder rates have dropped a bit since then, but have remained near the top in homicide rates around the world since the late 1990's. The commissioner says he is pleased with the achievement as guns are used in over 80 per cent of murders committed locally. According to Williams, in time, the recovery of the weapons will result in a reduction in major crimes. It involves collaboration with the Haitian law enforcement authorities due to the high inflow of illegal guns from the French-speaking island. Mostly the home-made ones, and the rusty ones you stuff the nuzzle with gun powder! We need the WMDs Mr Commish! 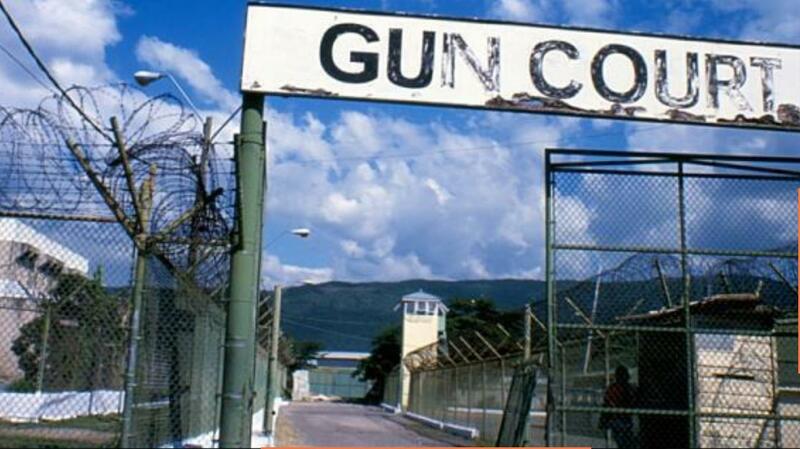 It is clear that the possession of guns is not the cause of the high murder rate in Jamaica. It is the change of the government from one in which most of the population trusted the police and the application of the rule of law, into a government in which two sets of criminal gangs trade rule based on who can commit the most vote fraud in the latest elections. Gun control is simply a ruse to distract the public from the real cause of the murders - a government that is allied with the criminal gangs, and a corrupt police force. If draconian gun control laws have not reduced the homicide rate in an island nation over the last 40 years, and in fact, have likely contributed to the increase, there seems little reason to believe that they would decrease homicides in the United States, where the sources of guns are much greater, the potential for illegal manufacture much higher, and the Constitutional restraints on police enforcement of gun laws much stronger. The current initiative to 'Get the Guns' is reminiscent of the gun 'buy back' events in the United States. They are primarily for political theater, rather than any real effect on crime rates. The number of guns needed for extremely high levels of murder are so small that they can easily be smuggled, illegally manufactured, or procured from corrupt police. When the people trust the government and the police, murder rates drop to extremely low levels. One significant way that a government can show that it trusts the people is to trust them with arms. Trust is a two way street. Andrew Branca, the author of the “Law of Self Defense,” recently reviewed a study on racial bias and Florida’s Stand Your Ground (SYG) laws published in the Elsevier Social Science & Medicine. The study, “Race, law, and health: Examination of ‘Stand Your Ground’ (SYG) and defendant convictions in Florida” (Social Science & Medicine, Volume 142, October 2015, pages 194-201; pay-walled) makes troubling claims about racial bias and convictions. Are these “manifestations” of racial bias a matter of settled science? Does this study really provide evidence of unequal treatment under the law? Pulling back the curtain, Mr. Branca examined the underlying data used – a listing of cases compiled by the Tampa Bay Times, a Florida newspaper, “supplemented with available online court documents and/or news reports.” The study itself was based on a subset of 204 cases out of the newspaper’s entire dataset of 237. After a close analysis of every one of the 237 cases, Mr. Branca found that 181 (over 76 percent) did not qualify as SYG cases at all, based on the legal definition of the term. It follows that even if all of the 56 remaining cases were included in the study’s subset of 204, the vast majority of the subset (148 cases, over 70 percent) were not actually SYG cases. Accordingly, research conclusions drawn from the 204 cases as if they were all SYG cases arguably lack factual integrity and scientific reliability. Florida gun shop owner who was sued by the Council on American-Islamic Relations for declaring his store a “Muslim Free Zone” has been vindicated by a federal court. Andrew Hallinan, owner of Florida Gun Supply in Inverness, was sued by CAIR’s Florida chapter after he made the declaration in a YouTube video in July. “The general desire of [CAIR] in this case to have Muslims able to access [Florida Gun Supply’s] shooting range someday in the future is insufficient . . . There are simply no facts grounding the assertion that [CAIR] and/or one of its constituents will be harmed—[CAIR] has failed to allege when and in what manner the alleged injuries are going to occur,” the court ruled. “As our motion and now the court’s ruling make clear, CAIR’s lawsuit was patently frivolous if not outright dangerous. No firearms dealer or gun range owner for that matter should be required to sell weapons to or train anyone that the dealer or owner has reason to believe is a terrorist threat. We all have a civic responsibility to prevent the next terrorist attack. CAIR’s lawsuit was an effort to prevent business owners from doing so,” AFLC Co-Founder and Senior Counsel Robert Muise said in the statement. There will be a gun turn in event on Saturday, 12 December, 2015 in Clearwater, Florida. Clearwater is in Pinellas County. While these events are commonly labelled with the propaganda term "buyback" the guns were never owned by the people attempting to buy them. This will be the Clearwater Police Department’s first buyback event since June 2011, when it collected 189 guns. Hall said officers plan to buy about $10,000 worth of gift cards to hand out at the event. Police will offer $50 or $100 Wal-Mart gift cards for the guns, depending on type of the firearm. Private buyers have little to fear about buying stolen firearms at these events. Florida even has a website where firearms purchasers can check to see if a firearm is listed as stolen in the State. Some police departments are hostile to private buyers; others are friendly. It is best to do local research before arriving to offer to buy firearms. The choice of a public venue of the Joe DimMaggio Sports Complex means that the police will have wide discretion about where private buyers can set up, where parking is allowed, and what access there will be to the parking lot. Some private buyers have been able to overcome these obstacles and achieve considerable success. Pinellas County Sheriff's Office offers free Concealed Carry courses to obtain the Florida concealed carry permit, so the entire county is not a hotbed of anti-self defense zealots. Here is how private buyers handled challenges in Jacksonville, Florida. A brilliant article by Rob Morse. I think we scare the elites. Today, average folks like us can get our news from a thousand different sources. Unfiltered by the mainstream media, we witness the growing corruption between government and crony businessmen. We see the growing gap between what the mainstream news tells us and what we see with our own eyes. We continue to live our own lives despite that government collusion and media corruption. We can’t be bought. For the most part, we can’t be pushed around. Our independence frightens the dishonest political and business elites. They want us disarmed. They want us disarmed for their benefit, not for ours. The elite media and Democrat politicians have been working on disarming us for a while. First, they distorted the news stories about gun owners. When that didn’t change public opinion, the elites lied to us. That is why the news about armed self-defense seems so contradictory to the real world we see around us every day. Excellent court decision at the Wisconsin Appellate court level. Knives are arms protected by the Second Amendment. Applying the Second Amendment to knives as arms and the groundbreaking Heller U.S. Supreme Court decision, the Wisconsin Court of Appeals reversed a lower court decision that it was illegal for someone to possess a switchblade (automatic) knife in their home. PEMBROKE – A woman shot a man in the leg when he forced his way into her home Thursday afternoon, according to the Genesee County Sheriff’s Office. The woman was at home at about 3 p.m. when the man, with whom she had had a previous relationship, forced his way into her home in Pembroke. She allegedly fired shots at the man, who fled the area in a vehicle. During their investigation, police opted not to charge a 41-year-old Whitehall man who reportedly was involved in the exchange of gunfire Nov. 16, Grebb said. “We found he was acting in self-defense,” he said. "This is clearly an act of desperation. They are hanging their hat on being an educational institution," Walker said. The victim claimed he was “fearful about the other driver’s actions,” McKinley said, during the confrontation. The other driver then allegedly tried to open the victim’s car door, so the victim allegedly flashed a handgun at him. The display of the gun was apparently enough to scare off the other driver, and he returned to his vehicle and left. What might have happened if a few of the 1,500 concert attendees in Paris’ Bataclan theater had guns? The terrorists had time to kill, reload and kill again. The police unit didn’t come for more than a half hour. If a few people in the theater were armed, might they have killed the killers? France’s guns laws say you may not carry a gun unless police certify that you are “exposed to exceptional risks of harm” to your life. Few people even bother to apply. Fortunately, in America, laws in every state now allow adults to carry guns. Some predicted this would lead to more crime, but the opposite happened. Crime is down. Yet some towns, such as Chicago, Washington, D.C., and New York City, where I live, still make it nearly impossible for people to legally carry a gun. I know because I tried to get a license. The complainant met the officer on his front porch, handing over a Smith and Wesson .40 hand gun he said was used to shoot his neighbor’s dogs. The man said he was watching TV on his computer with one of his children and two others were in the downstairs living room playing when he heard the back door open. He said the dogs came into his house acting aggressive toward his children. The victim found a suspect trying to break into his truck, and opened fire. He shot multiple times but missed his target, said police. But the truck suspect was armed too. Police said he shot the victim in the stomach before taking off on foot. The victim went back in his home and called police. On Wednesday, 25 November, 2015, President Barack Hussein Obama signed the National Defense Authorization act. He had vetoed the first version of the bill to reach his desk on 22 October, 2015, about a month ago. In the latest version, S. 1356, there is a section, 1087, which re-authorizes the Civilian Marksmanship Program to sell surplus 1911 and 1911A1 pistols and their parts and accessories to the public. The sales are limited to 10,000 per year. There are about 100,000 of these pistols available that are surplus, so they should be available for several years. for the transfer of such surplus pistols. in paragraph (1) remain available for transfer.’’. I would have thought that the wording could simply have been changed to include surplus "pistols" not just 1911 and 1911A1s. Then surplus .22 caliber trainers, 9mm pistols, and .38 caliber revolvers would also have been available. Perhaps this is the best that the NRA felt they could get from this President. The NRA-ILA reports that there are other important parts of the bill as well. Section 215 removes ammunition and ammunition components from any possibility of regulation by the EPA, something that has been pushed by disarmists for years, without success. essary as a personal- or force-protection measure. I would have preferred that the phrase "such a firearm is necessary" had been changed to "such a firearm is useful", which would have given the commanders much greater protection and flexibility. But it is better than nothing, and can be built on for the future. There is a small amount of good news included with the President's holding defense spending hostage to his desire for even more bloated non-defense spending. I suspect that the military .45 pistols will sell quickly. The LA times has an article about a homeless man who was found in possession of two submachine guns a couple of magazines, a couple of pistols and an improvised suppressor. From the picture it appears that the two submachine guns are a reactivated/remanufactured Sten in 9mm and a reactivated/remanufactured vz.26, which is normally chambered in 7.62x25 caliber, the common East block pistol and submachine gun round that is nearly identical to the 7.65x25 Mauser cartridge. This ad shows the deactivated vz.26 as being available in the European Union for 95 Euros. Parts kits have been available in the United States, but do not included an intact receiver, only stubs from the receiver tube, for $62. Here is a link to a person who hoped to rebuild one of the parts kits into a legal semi-auto pistol. He expected to spend about $600 on it in 2013. The vz.26 has a large oil filter attached to the muzzle. These are reported to make effective improvised suppressors. The first round fired creates a hole for the rounds to follow. It is questionable how effective it would be on the 7.62x25 round, which has a supersonic velocity of nearly 1500 feet per second. 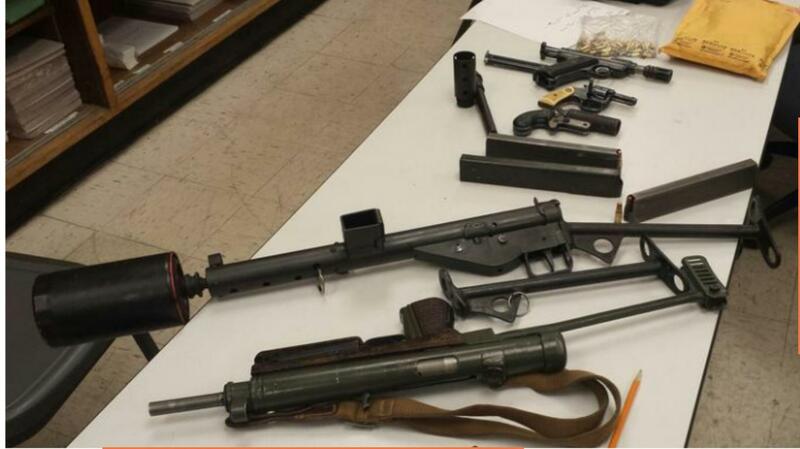 The LA Sheriff's Department, which took the picture, reported that the Sten and the vz.26 were fully functional. You can see two loaded magazines for the vz.26 loaded with the 7.62x25 bottleneck rounds in the magazines. I can only see three handguns, a Ruger MK1 that has an AR-15 flash suppressor attached to the barrel, an Rohm RG-10 .22 revolver or close facsimile, and Cobray model DD .410/.45 Colt Derringer. The Cobray was offered in kit form about 20 years ago. The department reported that there were two improvised suppressors; perhaps they included the AR-15 flash suppressor as an improvised sound suppressor. I do not see a fourth mentioned handgun; it may well be outside the picture frame. These reactivated/re-manufactured subguns should really count as homemade guns. They almost certainly have no serial numbers. Very likely the Cobray derringer has no serial number either. Because the firearms were found in the possession of a convicted felon, a prohibited possessor, the firearms were likely created specifically for the black market. About two months ago, for two weeks in early October, the local WalMart near to my Daughter's place in North Dallas had .22 Federal Champion ammunition available for less than 5 cents per round. It was in 50 round boxes, at $2.47 per box, with a limit of three boxes per customer. I checked again, on November 24th. The shelves were empty of inexpensive .22 rimfire once again. 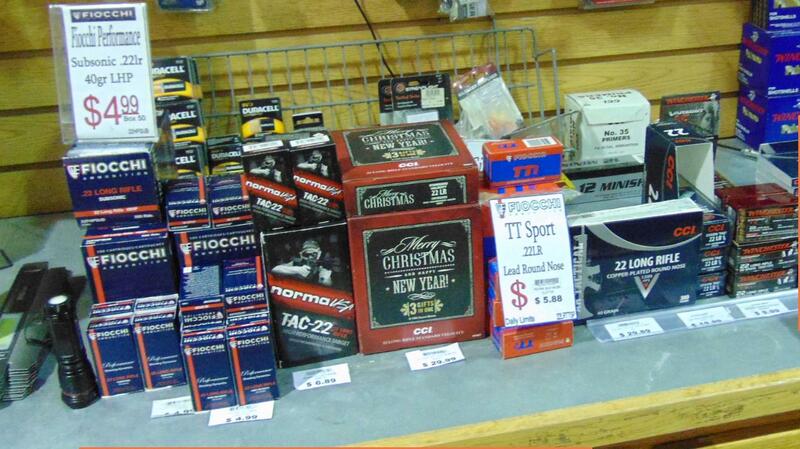 There were a few boxes of CCI .22 LR shotshells at $7.87 per box. That is about 39.2 cents per round. You can easily find it for that price on the Internet. Some places are carrying it as low as 28.5 cents per round, in the 20 round box. 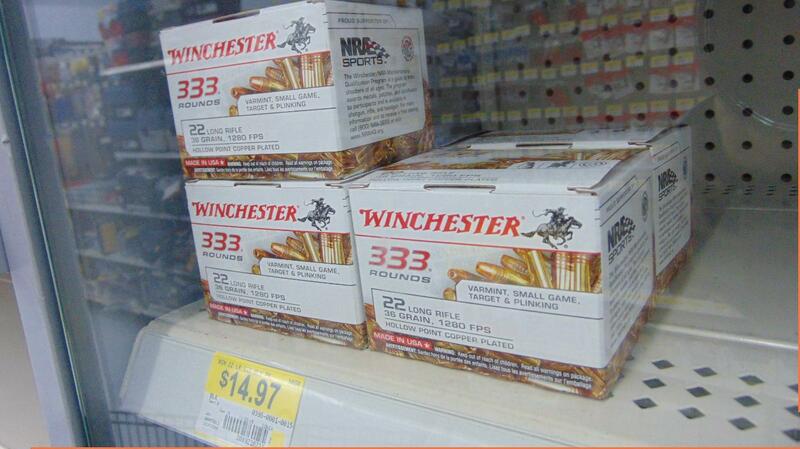 The price for CCI .22 LR shotshells is the same in that WalMart as it was in early October. A number of significant events have occurred since the middle of October, any one of which could cause a resurgence in demand for .22 LR ammunition. The rampage shooting in Colorado, the increase in knife attacks in Israel, the Jihadi attack in Paris, the call for more gun control in the United States, as a reflexive response from the left; President Obama's statement that he will push hard for more gun control in his last year. All of those things make people who believe that they do not have a sufficient stock of .22 ammunition for potential bad times, increased federal legal restrictions, or who may face extra burdens placed on them by local governments, have reason to buy some more ammunition. This keeps the demand high. Component costs of ammunition have dropped tremendously. Lead and other metal prices are down; oil and other feedstocks for making gunpowder are down. The price of a 12 gauge shotgun shell, which uses more than 10 times the components of a .22 cartridge (ll times the lead, 20 times the gunpowder, a separate wad, and intricate primer that the .22 does not need) is commonly available for 22 cents a round. If demand were to drop, there is reason to believe that .22 ammunition would be available at about 3 cents a cartridge. I purchased bulk .22 (Federal Champions) for just over 3 cents a round in 2012. At that point, oil prices and metal prices were much higher than they are now. It is clear that political fears are sustaining the .22 LR bubble. .22 LR is available, but you have to hunt to find it for less than 8 cents a cartridge. There was plenty of .22 available in Sprague's, a local gun store in Yuma. But most of it was at 10 cents a round, or more. All of the Democrat candidates have indicated that they wish to install new, stricter gun control measures. We may have to wait until a Republican President is elected and in office before the demand for .22 LR drops enough to bust the .22 LR ammunition bubble. Strict controls on the ownership and use of guns have been enacted in a number of polities in the United States. One of the supposed purposes of such laws is to reduce the murder rate. Murder rates in the FBI Uniform Crime Reports (UCR) consist of murder and non-negligent manslaughter. When strict controls do not produce low murder rates, such as in Chicago or Washington D.C., the claim is made that the problem is the easy access to guns in areas outside of the polity with the strict controls. In Washington, D.C., it is claimed that criminals can easily obtain guns in Virginia. In Chicago, gun shops in Indiana are blamed as the source of guns. Here is a look at three island polities that are under U.S. Jurisdiction that have implemented strict controls on gun purchases and ownership. These islands must be reached by air travel, where the carry of firearms is highly regulated and restricted, or by ship. If the problem with crime rates in Washington, D.C. and Chicago, or even New York City, is caused by the inflow of guns from areas with less restrictions on the purchase and ownership of guns, these polities should show a decrease in murder rates, as criminals cannot simply drive across state lines to obtain firearms. Murder rates have been selected because they are the most carefully reported and investigated crimes, so they provide the best index of unjustified violence. First island polity: The United States Virgin Islands. The U.S. Virgin Islands has extremely restrictive gun control. No guns are allowed to be legally owned without permission from the Police Commissioner. His discretion is complete and final. Even antique guns are subject to his approval. Approval is hard to get, and involves a lengthy process. The U.S. Virgin Islands were purchased from Denmark in 1917. They have local self government and elect their own Governor. But self government with extremely restrictive gun laws has not resulted in a low murder rate. The murder rate in the U.S. Virgin Islands was 32.9 per 100,000 in 2013, down sharply from the previous year, but still over seven times as high as the average murder rate for the entire United States, which was 4.5 per 100,000 in 2013. Second Island Polity: Puerto Rico. Puerto Rico has been under United States administration from 1898, when the United States took possession of the Island from Spain in the Spanish - American war. Puerto Ricans have been U.S. citizens since 1917. Puerto Rico has had extremely restrictive laws. All guns are required to be licensed and registered. The difficulty of obtaining a permit to purchase is time-consuming and expensive. No ammunition can be purchased unless it is for a firearm specifically mentioned on the gun license. The murder rate in Puerto Rico in 2013 was 24.4 per 100,000 population. That is over 5 times the average rate for the entire United States. In June of 2015, a Puerto Rico judge ruled most of Puerto Rico's gun laws unconstitutional. It is too early to determine if the ruling will have an effect on the murder rate. The ruling is likely to be appealed to the Puerto Rico Supreme Court. Hawaii was annexed as a United States territory in 1900, two years after the acquisition of Puerto Rico and 17 years before the acquisition of the U.S. Virgin Islands. Hawaii became a state in 1959. Hawaii, unlike the U.S. Virgin Islands or Puerto Rico, has a state Constitution with a segment identical to the U.S. Constitution's Second Amendment, protecting the right to keep and bear arms. Hawaii has strict gun control, but not as strict as the U.S. Virgin Islands. The restrictions are similar to the restrictions in Puerto Rico. All guns have been required to be registered since 1994, but guns possessed before the 1994 legislation was passed are grandfathered in. There are lawsuits pending that challenge the constitutionality of some of the Hawaiian gun laws, but the laws are still in effect as of 2015. The murder rate in Hawaii is much lower than the average in the United States. In 2013 the murder rate was 1.5 per 100,000 population, about one third of the United States average or 4.5 per 100,000. Three United States island polities with quite similar, strict, gun control laws. Two have murder rates more than 7 and 5 times greater than the United States average; one has a murder rate one third as great as the United States average. It is clear that the gun control laws are not a major factor in the rate of murder. It is highly unlikely that effects of stricter gun laws, such as those pushed by former Mayor Bloomberg's organizations, will have any measurable effect on the homicide rate in Chicago, Washington D.C., or in New York City. Many of the polities with far less restrictive gun laws on the purchase and possession of firearms, have far lower murder rates, such as Vermont, with 1.6 per 100,000; or Utah, with 1.7 per 100,000. A major problem with trying to lower murder rates with gun laws aimed at restricting the entire population's access to firearms is that only a tiny number of guns are needed to supply those involved in violent crime. From an economic perspective, it does not matter much if you attempt to fill a bucket from a small pond or an ocean; filling the bucket is easy in either case. There have been numerous studies on the effects of implementing strict controls on the purchase and ownership of firearms in the United States. The controls appear to have no effect or to be associated with somewhat greater homicide rates. The controls on gun purchase and ownership are slightly less strict in Hawaii than they are in the U.S. Virgin Islands, yet the murder rate in Hawaii is at least 20 times lower. Utah or Vermont have only modest controls on purchase and possession of firearms, yet their murder rate is similar to Hawaii's. It is the demographics of the population, and how they perceive the effectiveness of the justice system that controls the murder rate. Legal access to weapons has little effect. A man returned gunfire and scared off two men this morning after they allegedly forced their way into his Sevierville home. According to the Sevier County Sheriff’s Office, a person called 911 at about 8:53 a.m. on Monday, Nov. 23, 2015 to report gunshots coming from their neighbor’s home on Hilltop Road in Sevierville and that they saw two subjects flee in a red truck. Another 911 call was received a few minutes later, this one from the residence at which the gunshots originated, reporting a home invasion with shots fired. Officers arrived on the scene at 9:08 a.m.
BATON ROUGE - Police said a man who shot his roommate during an argument in Baton Rouge did so in self-defense Monday night. The homeowner said he saw two burglars removing his property from a shed in the back of his house. The homeowner armed himself with a pistol and ran outside to confront the burglars. He ordered them to the ground. One of the burglars aggressively threw down the items he had stolen and violently lunged at the homeowner. The homeowner then shot the burglar. The homeowner continued to hold both burglars at gunpoint while police were on the way, but the burglars took off running from the scene. WILLIAM SPORT — A Lycoming County woman acted in self-defense when she shot and killed her boyfriend nearly a year ago, the district attorney says. District Attorney Eric R. Linhardt Tuesday said he will not authorize a homicide charge against Sherri Lynn Scarantino, 39, in the death of Ty D. Kimble, 40. She will be issued a summons on a state police charge of firearms not to be carried without a license, he said. DALLAS — A Dallas homeowner shot and killed one of two intruders early Tuesday morning at his residence, said Dallas police in a statement released later in the morning. No jury would convict this man for believing they were armed, after they saw the pistol grip hanging out of the thief's pocket. A Laton-area homeowner detained two burglary suspects at gunpoint after riddling their getaway vehicle with gunfire Friday, the Kings County Sheriff’s Office reported. The incident happened about 3:40 p.m. in the 17000 block of Everett Avenue, where the victim called 911 and reported two men were breaking into his home and stealing from the garage. The homeowner, armed with a small-caliber handgun, confronted the pair as they carried tools from the garage. Perhaps I should not be surprised. Jewish leaders that insist that everyone remain defenseless. Belgian Jewish leaders denounced calls for their governments to issue gun permits to members of their communities this weekend, saying that such efforts could lead to harrowing consequences. Both community heads and Jewish business owners should be trained in firearms and be permitted to carry them, he said in a statement. “There is absolutely no intention to create a pro-active force. Rather, we expect local authorities to identify, train and oversee all designated armed personnel,” Margolin said. Belgian Jews were quick to distance themselves from Margolin’s comments, asserting that he does not represent their communities. “I think that he has no authority to speak in the name of Belgian Jewry because he doesn’t represent Belgian Jewry,” Abraham Guigui, the country’s chief rabbi, told The Jerusalem Post on Sunday. Calling for Jewish gun ownership would be tantamount to an admission that the Jews are outside of mainstream European society and that their governments are unable to provide for their security, he explained. Such a view is considered unacceptable to the vast majority of Belgian Jews, he said, calling on the government to defend every Belgian no matter his religious creed. Mechanical engineering student James Patrick recently uploaded a video to his YouTube channel showing off the fully functional PM522 Washbear .22LR revolver that he designed and 3D printed. With the exception of the firing pin, a few elastic bands that act as springs and the legally required amount of detectable metal, the entire gun including the body and cylinder is completely 3D printed. This is, to my knowledge, the very first functional repeating firearm ever made entirely (This doesn’t count, it has metal barrel inserts) on a desktop 3D printer. The optional 8 barrel revolver needs metal tubing inserts for each individual chamber. The frame of the PM522 Washbear was designed to hold either a six or eight shot pepperbox revolver, however the six shot is printed in a more durable nylon material while the eight shot is printed in ABS with steel chamber liners for extra strength. Both barrels will fit in the same gun frame, so they are interchangeable. All of the stl files have been optimally orientated by Patrick in order to maximize the strength of the material and prevent failure. For instance, the gun frame is printed flat on its side while the revolver is printed standing up. By putting them together the frame is strong enough to contain the the pressure of firing and keep the cylinder layers from splitting. In contrast, the 3D printed Liberator handgun designed by Cody Wilson holds and fires only a single bullet, and doesn’t always survive for a second shot. If what Patrick says about the PM522 Washbear is accurate, this is a significant upgrade from the Liberator, although he does warn that the gun isn’t intended for repeated usage. Patrick also suggests that subsonic ammunition is the best choice of ammo because it won’t break the sound barrier when it fires, resulting in no shock wave as the slug leaves the chamber. "A definitive and in-depth examination of the Anti-Gun Movement's claims and tactics, and the facts and statistics that completely refute them; written not by a Politician, Political Operative, or Media Expert with a bully pulpit, but by a regular American Citizen who is tired of seeing our rights and Constitution under attack by those who mean to control every aspect of our lives." PublishNext says that, "'These Are My Guns' is a well-written, data-driven treatise on the right of United States citizens to own guns. It looks at the country's founding documents and major Supreme Court cases, examines common arguments against gun ownership, and presents statistical data supporting ownership. The manuscript is well-documented, containing many citations." A growing legal battle has mounted in New Jersey, with the state claiming that a homeowner was hunting when he shot three bears – but the man claiming it was self-defense. As CBS2’s Valerie Castro reported, Robert Ehling well remembers the day last October when he shot and killed three bears on his property in Sparta, New Jersey. “I put another shot in him right behind his shoulder,” Ehling said. It was an early morning when he heard his wife scream from their kitchen. A 300-pound bear on their back deck was trying to get inside the home to reach a bag of birdseed. Representative Mike Kelley holds a conceal and carry weapons class. He started teaching the courses as a way to fund his reelection campaign while doing something he saw as productive to society. Today, 18 people show up for the 8 hour long class that includes lecture and time at the shooting range. Those with conceal and carry permits have a different set of laws to follow, something the class reviews extensively. Kelley believes that when it comes to events like the recent Paris attacks, those carrying concealed weapons could be a big help. George Kennedy says he went out to his garage Thursday morning and saw Lujan loading the couple’s stuff into a Jeep. He said he confronted Lujan, who apparently didn’t care and kept doing what he was doing. So George Kennedy got serious. “The victim went inside his house, armed himself with a shotgun, grabbed his wife, she armed herself with a handgun, out they came and held the guy at gunpoint,” Tixier said. Police would show up moments later and noticed a Metropolitan Detention Center band on Lujan’s left wrist. Morrison reportedly went back into the house, where he collapsed. Cheyenne Police's investigation revealed that Mathis was following Morrison toward the front door of the house with the pistol in his hand before Painter fatally shot him. Although the investigation remains open while detectives await finalized reports, Long said it appears that Painter acted in self-defense. Long said Painter has not been arrested or charged with any crime. Initial information released by Long said that Morrison, who was reportedly shot first, was taken to Cheyenne Regional Medical Center after the shooting and died there. Undercover officers assigned to a task force had come to a house on Wilbur Street in Southwest Dallas to put a tracker on a vehicle when the shooting started, leaving an undercover Arlington Police officer wounded. It appears that the officer may have been mistaken for a car burglar. CHEYENNE (WTE) - The Cheyenne Police Department has released the name of another man they say was involved in a shooting Sunday night that resulted in the deaths of Justin Morrison and Darius Mathis. Servando Flores, 33, was initially arrested on suspicion of second-degree murder in the Nov. 1 fatal shooting of 23-year-old Edward Tanner Jr.
Chief Trial Deputy Trevor Moritzky said Flores was acting legally — either in self defense or to stop a burglar — when he killed Tanner at the Madison Park Apartments in the 3300 block of East 120th Avenue. CINCINNATI -- A gas station owner shot a suspect Friday night in East Price Hill, Cincinnati police said. Officers got a report of a robbery at the Marathon station at Warsaw Avenue and Del Monte Place at 7:45 p.m., Lt. Craig Gregoire said. Andre Dawson, 27, was in the line of fire after a woman shot at him when he allegedly tried to steal the purse of a different woman. Witnesses recorded the incident from across the street. In the video, you can see the woman pointing a pistol at Dawson who was struggling with a man. When he got away, the woman shot at the suspect. A Northwest Jacksonville jewelry store owner shot Thursday night in a struggle with two robbers managed to shoot one of the masked men attempting to rob him, the Jacksonville Sheriff's Office said. The wounded robbery suspect showed up at a hospital just after 10 p.m. Thursday and died from his injuries Friday, police said. He was identified by the Jacksonville Sheriff's Office as Kurt Dean, 24.
Who do you believe, the officer, who was there, and who the investigators say the physical evidence supports, or the Teens Father, who was not there? After spotting the teen, Latimer borrowed a neighbor's gun to inspect and told Lake County deputies the minor charged at him outside the home. He said he had no choice but to shoot him, deputies said. The teen's father told the Orlando Sentinel a different story during an interview, claiming his son had been shot while trying to run away. The burglar was warned, but kept trying to break in. MARINE, IL (KTVI) – A Madison County man picked the wrong home to burglarize Thursday night after being sent to the hospital for a gunshot wound to the chest. The incident happened several miles east of Marine, a village of less than a thousand residents. The homeowner, who lives on Mayer Road, woke up to find a man trying to enter his home. Madison County Sheriff John Lakin said the homeowner had every right to protect his property – and he did. "Kansans soon can carry concealed weapons without permits or training under a bill signed by Gov. Sam Brownback on Thursday. The new law, which kicks in July 1, makes Kansas the sixth state to allow “constitutional carry.” It will allow Kansans 21 and older to carry concealed firearms regardless of whether they have obtained a permit. Training still will be required for anyone who wants to carry a concealed gun in the 36 states that accept Kansas permits. Brownback touted the importance of training, explaining that his youngest son took a hunter safety course this past week. “It was an excellent course. He got a lot out of it. I got a lot out of it. And I want to urge people to take advantage of that,” said Brownback, who was flanked by Republican lawmakers and representatives from the National Rifle Association and Kansas State Rifle Association. “We’re saying that if you want to do that in this state, then you don’t have to get the permission slip from the government,” Brownback said. “It is a constitutional right, and we’re removing a barrier to that right.”"
Governor Brownback's commitment to protecting the 2nd Amendment rights of Kansans is admirable.We hope that other governors recognize his wisdom. If you look closely at the photograph, it is clear that Steven Jones likely suffered some blows to the head. His lower lip is swollen, and you can see abrasions on it and one to the his right below the lip. There is also a abrasion just to his left and above his left eyebrow. It appears that Jones had legal possession of the handgun. It would have been legal for him to have carried it in his car in Arizona. But the surviving victims and other witnesses told varying stories that corroborated some of Jones' statements and contradicted others. Jones, who wept during police interviews, claimed he got his Glock pistol from the car and told the pursuers, who were then surrounding his friends, that he had a gun. He said he shot two of the attackers, again saying they would kill him, when they charged him. Blows to the head can easily be lethal, as can attacks by multiple assailants. If Jones version of events is correct, or if he can show a jury that it was reasonable for him to believe that his version was correct, he could easily be justified in his use of deadly force to defend himself and others. Jones cooperated fully with police; he even sought their protection when they came to the shooting scene. He does not fit the profile of a rampage shooter. He is not a loner, nor did he attempt to shoot people randomly. There is testimony that his version of events is correct. 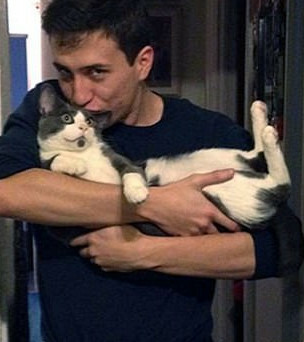 Without his glasses, he may have been visually impaired. In Piring's version of events, he was not standing with Brough but saw him fall and then was shot as he walked toward him. Piring said he didn't see any fighting. Piring said he saw Brough fall as he was running toward him and did not realize at first he had been shot as well. With all the surveillance video available today, with numerous cell phones, I hope the police have been diligent in searching for evidence. Even placement of the cases ejected at the scene would be important; Jones said that he fired again, in an upward direction, as several men knocked him down and attempted to disarm him. It should be easy to determine if Jones were attacked before he fired, about how far he was from the people that he shot at, and how many people were involved in the initial attack, how many were involved in the chase that supposedly followed, and how many attempted to disarm him. Blood should have been drawn from Jones and the others involved to determine blood alcohol levels or the presence of other drugs. Jones told police that he shot them after he was hit in the face. He said the shooting was in self-defense. "I don't think there is any doubt at this point that he was attacked outside that parking lot and then chased into that parking lot," said Jones' attorney, Burges McCowan. Jones was a pledge with the Sigma Chi fraternity. All of the men shot were from Delta Chi Fraternity. Led by Rep. Jackie Speier (D-Calif.), the Democrats said the so-called Dickey Amendment — a long-standing provision that has effectively blocked federal research on gun violence — leaves lawmakers in the dark when it comes to crafting policies aimed at tackling the problem. "We dedicate $240 million a year on traffic safety research, more than $233 million a year on food safety, and $331 million a year on the effects of tobacco, but almost nothing on firearms that kill 33,000 Americans annually," the lawmakers wrote. Disarmists turned to the attempt to "medicalize" crimes committed with guns when research funded by the Justice Department did not show any support for more restrictive gun control policies. It is why you see most research funded by Michael Bloomberg in medical journals, not in criminological journals or in economic journals. Medical "researchers" seem to feel no need to cite studies done in other fields. They routinely ignore studies by Gary Kleck, or John Lott, for example. 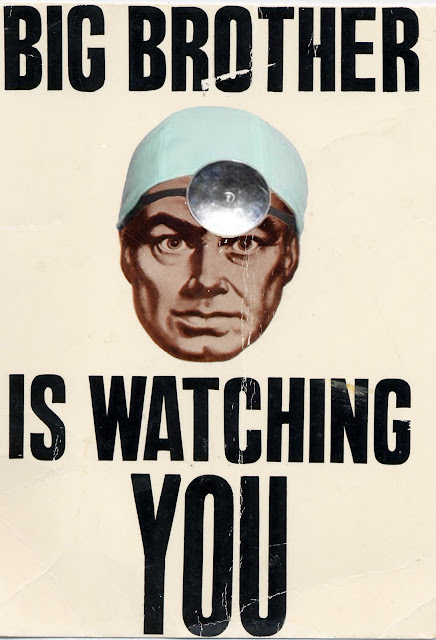 The disarmists want the CDC to be able to produce more propaganda. The scandal is that the CDC ever produced any to begin with. There are plenty of studies about guns and crime, guns and suicides, and others. They are simply not funded by the CDC, and rightly so. Are we, as some insist, in the midst of a gun violence crisis? Gun control advocates would certainly have you think so. A quick look into the facts reveals an entirely different picture. According to the FBI, in the past two decades, violent crime has been falling almost continuously. In 2013, the number of violent crimes perpetrated was 37 percent lower than it was just two decades earlier. In 1994, there were 23,326 murders in the United States; by 2013, that number had fallen to 14,196, an incredible 39-percent decline. More specifically, according to the Department of Justice, the number of firearm-related homicides declined from 18,253 in 1993 to 11,101 in 2011. The Department of Justice further concludes that even non-fatal gun-related crimes are declining, dropping 69 percent between 1993 and 2011. While the exact causes for this dramatic decrease can be debated, the decrease itself raises the question: Where does this idea of an “epidemic” of rising gun violence come from? The most significant factor may be the large-scale media coverage of and public interest in mass shootings. Americans are captivated by stories of mass shootings and have followed them closely. According to the Pew Research Center, in 2012, 57 percent of the American public said that they followed the Newtown, Conn., school shooting “very closely.” The attention given was second only to that year’s presidential election. The Pew Research center further reports that 48 percent of Americans also paid close attention to the movie theater shootings in Aurora, Colo. The simple fact is that horrific headlines, such as the number of children gunned down in a school, have a greater shock value than nearly any other kind of story. The media understand this. Seeking, as always, the highest ratings, media companies tend to disproportionately report on mass shootings even though mass shootings account for only a fraction of the total number of homicides committed each year. LOGAN SQUARE — A longtime Logan Square resident had a burglar scrambling Sunday afternoon when he confronted the man with a handgun. The confrontation, which was captured on surveillance tape, shows the burglar rummaging through the victim's vehicle for 25 seconds before bolting for cover. Two men were shot Thursday morning during what police are calling an aggravated robbery at a Wichita Falls gun store, and police are searching for one possible suspect who left the scene in a vehicle. The shooting occurred at 10:48 a.m. at a gun shop along the 4700 block of Southwest Parkway. The story says "machete" but the picture looks like a sword. Police responded to the Dairy Queen in the 1200 block of Military Street shortly before 6:40 p.m. Tuesday after it was reported a man with a machete threatened the employee inside and took cash. Carter Smith, 19, said Wednesday the man entered the store and ordered a Blizzard. As he rung up the order, Smith thought the man was going for his wallet, but he instead took out a machete. The man then demanded Smith go to the back of the store, took cash from the register and fled. Amid the horror and outrage over last week’s Paris terrorist attacks, on the pretext of stopping terrorism, New York Democrat Congressman Pete King is pushing a scheme to deny your Second Amendment rights—and deny your right to due process in the bargain—by banning firearm sales to anyone on the FBI’s so-called Terrorist Watch List. Police say two people jumped over the fence of an apartment complex on Greens Parkway at Fall Lake Drive after 10:30pm and attempted to kick in the man's front door. The resident grabbed his gun and started shooting at the suspects as they tried to make entry into his apartment. The suspects fired back, striking the victim in the leg. He was taken to Ben Taub hospital for treatment. It is legal to shoot at burglars to prevent theft of property in Texas. LAMAR COUNTY, Texas (KXII) - A Lamar County man came home to two burglars inside his home Tuesday. 80-year-old Eldon Foster is a rancher. He's also a veteran and an avid hunter. So when he got a call from a neighbor that some strangers had broken into his Ragtown home off FM 197 Tuesday morning, he knew just what to do. "I just try to take care of business until the sheriff gets here," said Foster. He and his son locked and loaded, and chased Jesse Keene, 24, and Samantha Varner, 25, out of his home. "I had a shotgun, and my son had a pistol," said Foster. "We tried to stop them and they wouldn't, so we popped their back tires." Officers responded to Gas and Go at 9 p.m. Nov. 10 for a report of an armed robbery. The suspect had already fled the scene after the clerk, a 23-year-old Brookpark woman, shot at his vehicle. He got away with an undisclosed amount of money. The incident is under investigation. "It's a blatant attempt by a Sacramento politician to aggrandize herself with the anti-gun group in San Francisco and Los Angeles and garner votes among that group," said Coleman. Some of the guns in Sheakalee's possesion are banned in California, but Coleman has the 2006 paperwork to show the guns are legal, and says he has a strong legal defense. WILKES-BARRE — Luzerne County has not seen a dramatic spike in applications for gun permits, but officials in the sheriff’s office reported Thursday their office has definitely been busier in the last few days. About 25 people were outside the sheriff’s office Thursday morning waiting to either apply for a gun permit or to renew one. Anthony and Cathleen Ortolani traveled from the Poconos to renew licenses they’ve had since 2007. Without hesitation, Eric reached for his own weapon from a nightstand and exchanged shots. "He took off, ran down the steps. I followed and someone at the bottom pointed his gun towards me, so I fired again and I hit him. I hit 'em both and he dropped the gun and bolted out the door," Eric recalled.